Do you need a sound system for your event or a mixing board operator for a music festival? Or perhaps you’re a performer in need of a live performance recording? Common problems with event sound include underpowered systems, uneven coverage, distorted audio and volume too loud, too soft or unbalanced. When recording live, you know you don’t get a second chance at the “take,” so everything has to be perfect the first time around. Paul’s worked his first professional live sound gig way back in 1976. Festivals, concert halls, and live audio feeds for TV and radio… with Paul’s extensive experience in configuring sound systems and operating the sound board, you can relax. 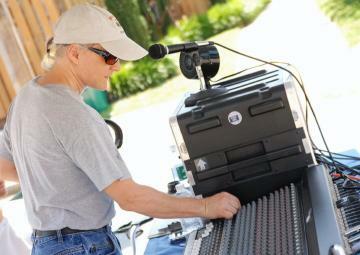 He brings professional-quality sound to your event, big or small, indoors or outdoors. His work on the sound board is consistently praised by audience members and performers alike. Ensure top-quality sound for your next function. Capture the excitement and energy of a live performance for your next audio recording. Contact Paul for more information or to book your event.